His long-awaited volume, a new selection of his later poems, spans ten major collections by one of America's most visionary and influential poets. Chosen by the author himself, the poems in Notes from the Air represent John Ashbery's best work from the past two decades, from the critically acclaimed April Galleons and Flow Chart to the 2005 National Book Award finalist Where Shall I Wander. 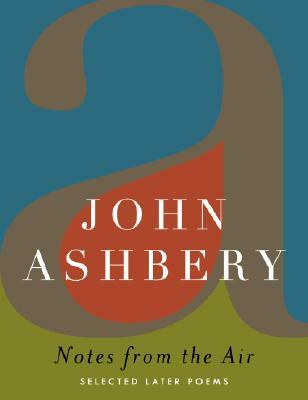 While Ashbery has long been considered a powerful force in twentieth-century culture, Notes from the Air demonstrates clearly how important and relevant his writing continues to be, well into the twenty-first century. Many of the books from which these poems are drawn are regularly taught in university classrooms across the country, and critics and scholars vigorously debate his newest works as well as his classics. He has already published four major books since the turn of the new millennium, and, although 2007 marks his eightieth birthday, this legendary literary figure continues to write fresh, new, and vibrant poetry that remains as stimulating, provocative, and controversial as ever. Notes from the Air reveals, for the first time in one volume, the remarkable evolution of Ashbery's poetry from the mid-1980s into the new century, and offers an irresistible sampling of some of the finest work by this "national treasure."